Calling all students! The Society for Clinical and Experimental Hypnosis invites you to submit a Poster or Research Presentation for the SCEH 2019 Annual Conference in New Orleans. See details on special student registration incentives below. Any student eligible for membership may participate in SCEH events. Have a Poster to Submit? We are looking for new ideas and topics in hypnosis and related fields that improve our understanding of hypnosis. While topics that address this year’s conference theme, Clinical and Applied Hypnosis: Evidence-based Practice and the Therapeutic Relationship, are requested, other topics are also welcome. Poster presentations allow authors to concisely present a case report or data that can be easily grasped in this format. Poster presentations often permit more discussion between presenters and attendees and may be especially advantageous for students, clinicians, and new investigators. The SCEH Poster Session takes place prior to the SCEH Annual Conference Banquet on Saturday evening and provides an excellent showcase of the latest research. Poster authors are asked to stand by their displayed poster and be prepared to answer questions about its content during the Poster Session. Prior to that, a brief Poster Blitz Session during the Scientific Program provides each poster author with 2- 3 minutes to describe their topic. The Society for Clinical and Experimental Hypnosis is extending its Call for Papers submission deadline to April 8, 2019. SCEH invites submissions of Workshops, Scientific Presentations and Posters for its upcoming Annual Conference in New Orleans, Louisiana in October of 2019. This year's theme, Clinical and Applied Hypnosis: Evidence-based Practice and the Therapeutic Relationship, puts a focus, first on selecting treatment interventions well tested by rigorous research, and second, on personal mastery of the relationship variables that optimize all therapeutic interventions. Our 2019 conference will feature keynotes, symposia, and workshops that illustrate these twin themes, as well as scientific presentations extending the scope of hypnosis in both medical and psychological practice. Proposals addressing the meeting theme will be prioritized. SCEH offers workshops and training in clinical hypnosis that are designed for both clinicians and researchers new to hypnosis, as well as those who wish to deepen their understanding. SCEH workshops meet accepted Standards of Training in Clinical Hypnosis and count toward SCEH Hypnosis Certification Programs. This year will also mark the Society's 70th Annual Workshops & Scientific Program, continuing a long tradition of excellence in hypnosis training. This event will examine the theme of Clinical and Applied Hypnosis: Evidence-based Practice and the Therapeutic Relationship. It will be held from October 16-20, 2019 at the Ace Hotel in New Orleans, Louisiana. This event features Introductory/Basic, Skills/Intermediate and Advanced Workshops plus a Scientific Program. A Call for Papers for this event is now underway. Conference registration will open in June 2019. Learn more. The Society for Clinical and Experimental Hypnosis invites submissions of Workshops, Scientific Presentations and Posters for its upcoming Annual Conference in New Orleans, Louisiana in October of 2019. 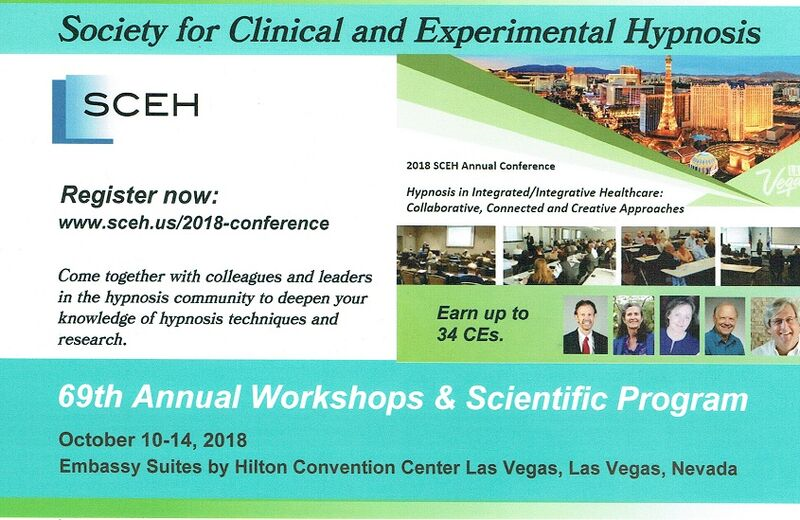 The Society for Clinical and Experimental Hypnosis will host its 69th Annual Workshops and Scientific Program in October in Las Vegas. If you want to understand how hypnosis can improve patient outcomes and learn about the latest research in this field, this event is for you. This year’s conferences examines Hypnosis in Integrated/Integrative Healthcare: Collaborative, Connected and Creative Approaches. This is your chance to network, collaborate and exchange ideas with leaders and peers who share a commitment to promoting excellence and progress in hypnosis research, education, and clinical practice. This year’s conferences examines the timely theme of Hypnosis in Integrated/Integrative Healthcare: Collaborative, Connected and Creative Approaches. View this brief slideshow for an overview of the conference and some photos from last year.